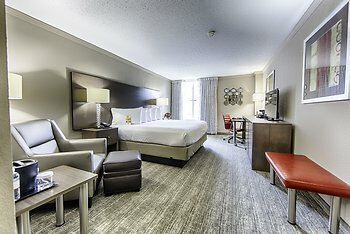 Hotel Capstone, Tuscaloosa, United States of America - Lowest Rate Guaranteed! A stay at Hotel Capstone places you in the heart of Tuscaloosa, within a 15-minute walk of University of Alabama and Bryant-Denny Stadium. This hotel is 0.4 mi (0.6 km) from Paul W. Bryant Museum and 0.5 mi (0.8 km) from Denny Chimes. Being able to stay on campus prior to and after University Day visit. It gave us a great opportunity to see the campus and surrounding area. Ample parking also helped as we were in and out during our stay. The room was spacious and fantastic! We got more than we expected! The room was nice and big, great view of the Coleman center and Bear Bryant museum. The downstairs restaurant was very expensive for breakfast and was sub-par at best. We loved the location of the hotel. Along with a welcoming staff at the hotel we were in the heart of the campus. We could walk to local bars and food and we were able to walk around campus as well. No need for a car unless the weather permits! Thank you for the great experience. We will be back! The quality of the hotel and staff. Clean, updated and a great staff. The location was perfect for me. On UA campus. Dining and the bar. I loved the friendly atmosphere and most were kind. A lady checked me she could have been a little more polite. She had short hair was middle age towards older I think a blonde. Everyone else wonderful! A great college town hotel! Outstanding! Can't beat the Hotel Capstone! Great location and comfortable! The room was so comfortable and the location was great. The public areas were freezing.